Wandering the yard chasing invasive weeds, Dave noticed an area that had been disturbed recently by some animal -- probably a deer, but there were no clear prints so we couldn't be sure. But among the churned soil, he noticed something that looked different from the other rocks. 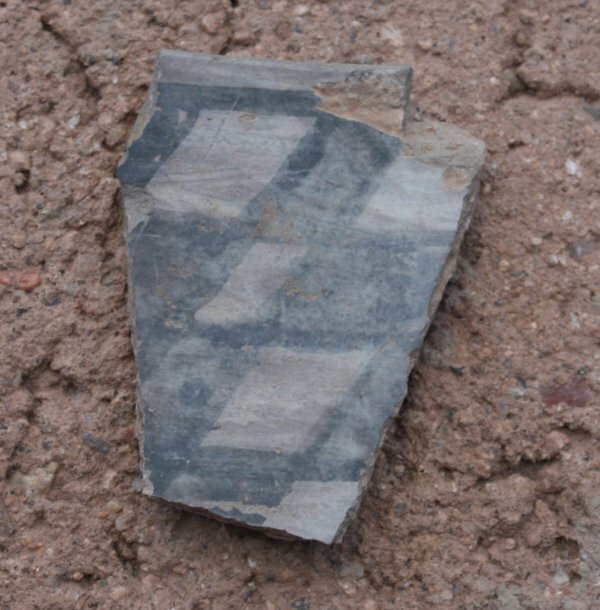 A pot sherd, with quite a nice pattern on it! Our sherd fairly large as such things go: the longest dimension is about two inches. Of course, we wanted to know how old it was, and whether it was "real". We've done a lot of "archaeology" in our yard since we moved in, digging up artifacts ranging from bits of 1970s ceramic and plastic dinnerware to old tent pegs to hundreds of feet of old rotting irrigation tubing and black plastic sheeting. We even found a small fragment of obsidian that looked like it had been worked (and had clearly been brought here: we're on basalt, with the nearest obsidian source at least fifteen miles away). We've also eyed some of the rock rings and other formations in the yard with some suspicion, though there's no way to prove how long ago rocks were moved. But we never thought we'd find anything older than the 1970s when the house was built, or possibly the 1940s when White Rock was a construction camp for the young Los Alamos lab. So we asked a friend who's an expert in such matters. She tells us it's a Santa Fe black-on-white, probably dated somewhere between 1200-1300 AD. Santa Fe black-on-white comes in many different designs, and is apparently the most common type of pottery found in the Los Alamos/Santa Fe area. We're not disappointed by that; we're excited to find that our pot sherd is "real", and that we could find something that old in the yard of a house that's been occupied since 1975. It's not entirely a surprise that the area was used 700 years ago, or even earlier. We live in a community called La Senda, meaning "The Path". A longtime resident told us the name came from a traditional route that used to wind down Pajarito Canyon to the site of the current Red Dot trail, which descends to the Rio Grande passing many ancient petroglyphs along the way. So perhaps we live on a path that was commonly used when migrating between the farmland along the Rio and the cliff houses higher up in the canyons. What fun! Of course we'll be keeping our eyes open for more sherds and other artifacts.